GALION — After concluding her track and field season with Northmor this spring, senior Hope Miracle will continue performing in that sport at Ashland University. Miracle, who will major in graphic design, noted that she liked a lot of aspects of Ashland. While at Ashland, Miracle will compete in the pole vault, while also taking part in the university’s honors program. “You have to have the grade point average to get in it and take certain classes for honors students,” she said. Before picking Ashland, she looked at a number of different schools, mentioning that since the beginning of last summer, she made over 14 visits, including trips to Marietta, Malone and Montevallo (Alabama). The thought of being able to compete athletically in college didn’t immediately come to Miracle, who noted that she started receiving consideration after a successful junior year which saw her clear 9’8” in the pole vault. That year provided her with one of her favorite track memories to this point of her career. “Probably last year at the district meet when I won it and got a new PR and set the school record,” she said. Miracle feels the sky is the limit for when she competes at Ashland, stating that she still is pretty inexperienced as a pole vaulter and believes she’ll only improve working under a coach dedicated to that event. 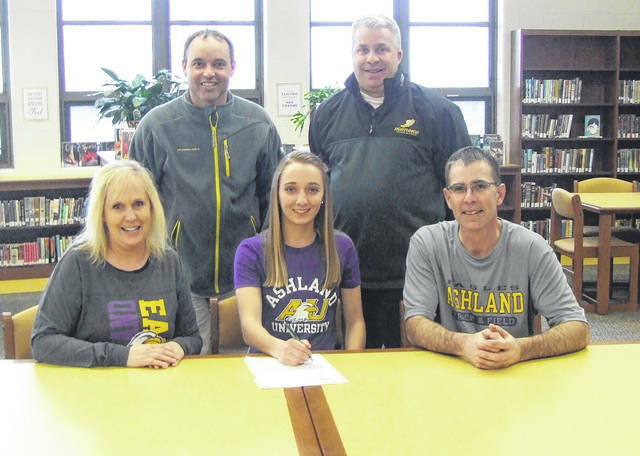 Northmor senior Hope Miracle signs to compete in track and field for Ashland University. In the front row with Miracle are her parents, Lisa and Todd. In the back row are Northmor track coaches Kevin Ruhl (l) and Mark Yaussy.